Now that you've added an extension, you can configure an instance of that extension for use in an environment. In the Extensions > (My extension name) page, click test to configure for the test environment. Version Select the extension version number to use. You might have multiple versions of the same extension installed on the system. GCP Project ID Enter your GCP project ID. 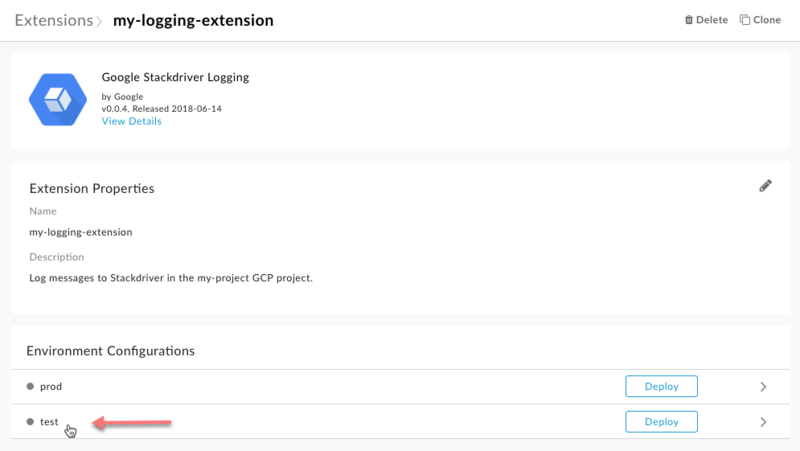 This is the project for which Stackdriver logging in enabled, and which has a service account assigned a Log Writer role. (Note that the project ID and name could be different. In the image below, `my-gcp-project` is used an example. However, you'll need to use your own project ID for the example to log messages. 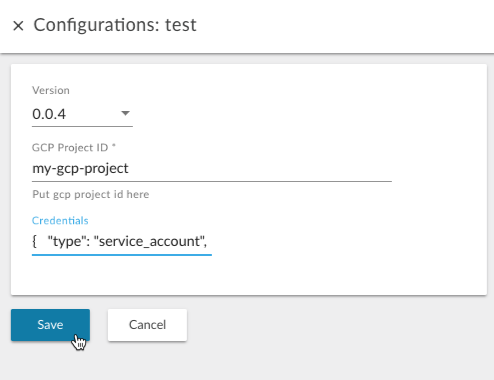 To get your project ID, open the GCP console and go to IAM & Admin > Settings. Credentials Paste the contents of the Service Account JSON file that you downloaded as part of the Prerequisites. Edge automatically Base64-encodes the JSON content. To deploy the extension to the test environment, click Deploy in the test row. Deploying the extension makes it available for requests from API proxies deployed to the same environment. You'll make those requests through the ExtensionCallout policy. When you click Deploy, you'll see a message such as "Deploying... This will take a few minutes." Don't worry, it probably won't take that long. The extension you just deployed should appear in the list. If the list is long, you can filter it by typing your extension's name in the filter box at the top of the page. You've deployed your extension! Now you're ready to try it out from an API proxy with the ExtensionCallout policy.